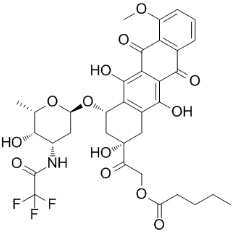 Valrubicin (AD-32) is a chemotherapy drug used to treat bladder cancer. Valrubicin is a chemotherapy drug used to treat bladder cancer. Valrubicin is a semisynthetic analog of the anthracycline doxorubicin, and is administered by infusion directly into the bladder.